Today's conglomeration is three different patterne put together. "They" say you can have two of the same pattern together so long as the patterns are different sizes. 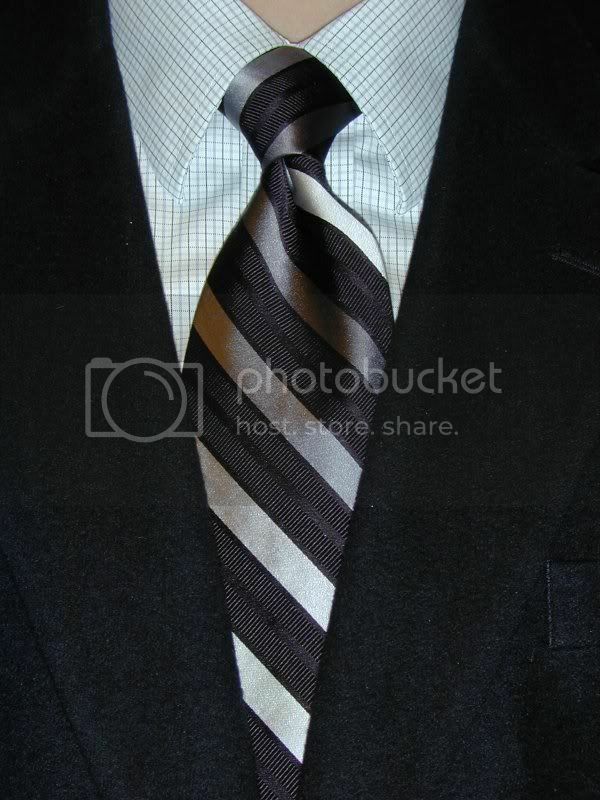 For instance, a wide striped necktie with a fine line dress shirt. I decided to try three different patterns. I don't know if the solid sportcoat classifies as a pattern though. Today's dress shirt is a spread collar, non-iron black and gray check. It's a pinpoint oxford weave. It's also the first check dress shirt that I have owned. I like it enough that I'm going to get more. The necktie is from Paul Fredrick. The stripes are black, gray, silver and white. It's knotted in a half Windsor. That does kind of depend on who calls it that though.